The massive-noggined boffins at TC Electronics have just released an incremental version of PolyTune for iPhone. You’ve probably all read about the PolyTune tuner pedal – the world’s first polyphonic tuner. Strum all strings together and the clever gubbins in the pedal shows the tuning situation of each of your six stings. You can easily tell if one or more strings is out of tune. OK, there’s no doubting that this is an interesting idea. Not just an amp in your pocket, it’s potentially a whole slew of amps, speaker cabs, microphones and stompboxes in your pocket. That’s either a big pocket or AmpliTube’s clever new interface/app combo for iPhone. The iRig is an external interface that plugs into the headphone socket of your iPhone. It allows you to plug in a standard ¼ inch guitar lead and has a pass-through for your actual headphones. iPhone guitar apps seem to be evolving into more and more complex utilities. We’ve considered just a few of the guitar-related apps before and now we’re looking at Guitarist and Bassist from MooCow Music. “Never be without your guitar again”, say MooCow Music. It’s a slogan we here at Guitarless can get behind. MooCow have released Guitarist and Bassist – instrument simulators for your iPhone. If you’ve got an iPhone, you may be familiar with Agile Partners who previously gave us the, very handy, Guitar Toolkit. It’s also worth knowing, however, that Agile also have an iPhone tablature application that does some very clever things. 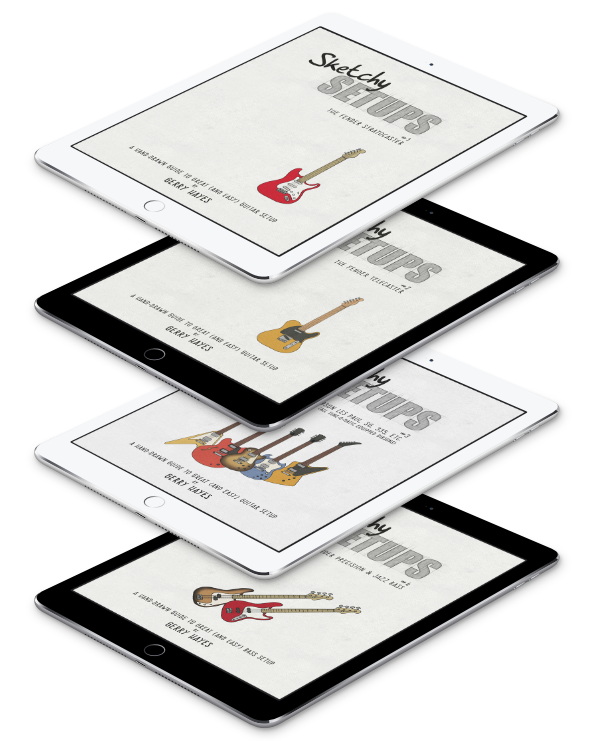 Agile Partners’ GuitarToolkit (iTunes Link) provides a bundle of guitary goodness all wrapped up in the Appley goodness of your iPhone. First off there’s a tuner. Using the built-in microphone on your iPhone, you can use the GuitarToolkit’s chromatic tuner to sort yourself out. Alternate tunings aren’t an issue and you can even create your own if whatever weird one you’re using isn’t available. Potentially more useful for guitarists to carry around in their pockets, however, is the scale and chord library. There’s half a million chords squeezed into this thing.